Higher Grade School, 1894 to 1921. 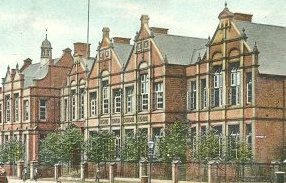 Wolverhampton Municipal Secondary School, 1921 to 1945. Son of Frederick Charles Cooke and of Annie Cooke (nee Slater); husband of Suzanne Nelly Cooke (nee Jacquot) of West Ealing, Middlesex. M.A. (Oxon.). Son of Joseph and Mary Hannah Baynton of Bilston. Died 25th November 1943 age 27. Grave Reference Coll. grave I.B.16-20. Royal Corps of Signals attd. III. Indian Corps Sigs. Son of Emanuel and Martha Ann Benton of Willenhall. husband of Enid Burns of Huthwaite Nottinghamshire. Died 25th March 1941 age 20. Grave Reference: 37. A. 4. Kranji War Cemetery. Son of Robert and Harriett Elizabeth Clayton, of Wolverhampton. Grave Reference: Coll.Grave 62-66.Row C.
Son of Samuel and Eliza Cowern of Wolverhampton; husband of Phyllis Cowern of Wolverhampton. Grave Reference: VI. D. 7. Bari War Cemetery. Son of Joseph Arthur and Alice Cox, of Wednesfield Wolverhampton. Heanton Punchardon (St. Augustine) Churchyard. Wolverhampton Borough Cemetery. Grave 10. 77 Sqdn. Royal Air Force Volunteer Reserve. Killed in Action 12th March 1942. 460 (R.A.A.F.) Sqdn Royal Air Force Volunteer Reserve. Son of Frederick Stanley and Florence May David of Wolverhampton. Grave 4118. Bushbury (St. Mary) Churchyard. Son of Alan and Eliza Ann Davies, of Wolverhampton. Grave Reference: 3. G. 1. Grave Reference: Old ground. Row 35. Grave 66. Grave Reference: Plot I/2. Grave 198. 862 Mechanical Equipment Workshop and Park Coy. husband of Margaret Finney of Oxley Wolverhampton. Grave Reference: V. F. 9. Bone War Cemetery, Annaba. Husband of V. Frazer of 231 Tithe Farm Court, Alexandra Avenue, South Harrow, Middlesex. 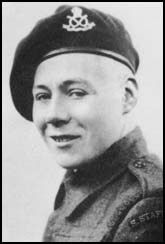 John was a member of the Home Guard and helped in defence duties during air-raids on London during 1940. He was assistant Manager of Brick, Croft and granite Co. and a football referee of First Division matches. He was killed while at work in his office, 15 Victoria Street, Westminster, London, during an air-raid, 11th November, 1940. Civilian Roll of Honour Section City Of Westminster. Son of William John and Rosina Alice Glasson, of Windsor. Grave Reference: Sec.B.Row B. Grave 11. Clewer (St. Andrew) New Churchyard. Son of Norman and Annie Mary Goulding, of Seattle Washington, U.S.A. Son of Harold John and Eva Ellen Hartlett, of Wolverhampton. Grave Reference: 1. B. 1. Son of Harry and Elizabeth Hughes of Wolverhampton; husband of Marjorie Hughes (nee Alcock). Grave Reference: Coll. grave 15763-15765. 255 Sqdn. Royal Air Force Volunteer Reserve. Son of Edward Stanley Jones and Mary Ann Frances Jones, of St. Albans, Hertfordshire. Grave reference XI. B. 8. Bari War Cemetery. Son of Bert and Jennie Large, of Wolverhampton. 107 Sqdn. Royal Air Force. Son of John and Edith Mitton, of Wolverhampton. Died 10th April 1945 age 23. 207 Sqdn. Royal Air Force Volunteer Reserve. Son of John and Ethel Morris, of Wolverhampton. 17 Field Regt. Royal Artillery. Husband of M. D. Meddings, of Whitmore Reans, Wolverhampton. Grave Reference 11. A. 4. Medjez-El-Bab War Cemetery. 51 Sqdn. Royal Air Force Volunteer Reserve. Son of William and Anne Winifred Mortimer, Wolverhampton. Killed in Action 26th June 1943 age 21. Grave Reference British Plot 2. Grave 6. Son of Abraham and Violet Newman, of Penn, Wolverhampton. Died 11th October 1944 age 18. Grave Reference Sec. 3. Grave 24. Son of Frank Henry and Amy Oakley; husband of Alice Maud Reid Oakley, of Bearsden, Dunbartonshire. Sec. B. Old Portion. Grave 1210. 2. Bilston Cemetery. Son of G. W. Roberts Pike and Jessie Gladys Pike, of Wolverhampton. Died 16th February 1944 age 20. 635 Sqdn. Royal Air Force Volunteer Reserve. Son of Harry and Dorothy Amy Pritchard, of Wolverhampton. Died 4th June 1944 age 20. Tettenhall Regis (St Michael) Churchyard. His father was the barber in Whitmore Reans. 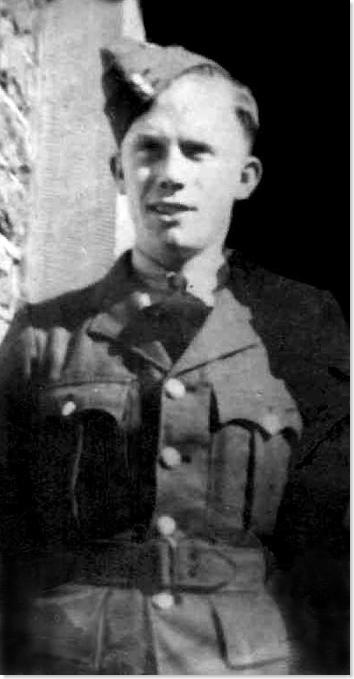 Accidentally killed 5th September 1941 age 15 while working at the School Farm Camp, Diddlebury, Shropshire. H.M. Trawler Almond, Royal Navy. Son of George William and Sarah Reynolds, of Penn. Killed 2nd February 1941 age 20, when his ship hit a mine off Falmouth and sank. Panel 50, Column 2. Plymouth Naval memorial. Son of Mr. and Mrs. William Roberts; husband of Edna Eileen Roberts, of Torpoint, Cornwall. Panel 59, Column 1. Plymouth Naval memorial. Son of Arthur Thomas Rowbery and Lilian May Rowbery of Wolverhampton. Killed in Action 22nd September 1944 age 22. Grave Reference: 16. A. 20. 103 Sqdn. Royal Air Force Volunteer Reserve. Killed in Action 31st May 1942 age 19. Coll. grave 18. A. 1-6. Reichswald Forest War Cemetery. 185 Field Regt. Royal Artillery. Son of Edward Theodore and Agnes Mary Shore, of Wolverhampton; husband of Mary Elizabeth Shore, of New Barnet, Hertfordshire. Grave reference III. E. 4. Ranville War Cemetery. "A" Sqn. Staffordshire Yeomanry Royal Armoured Corps. Died 18th July 1944 age 27. Grave reference IVA. E. 13. Ranville War Cemetery. 75 Sqdn. Royal Air Force Volunteer Reserve. Grave Reference Coll. grave 1. D. 6-18. 961 Balloon Sqdn. Royal Air Force Volunteer Reserve. Son of Henry Higginson Sutton and Nellie Maud Sutton, of Wolverhampton. Died 19th August 1942 age 25. Grave Reference 2. E. 2. Pihen-Les-Guines War Cemetery. 286 Sqdn. Royal Air Force Volunteer Reserve. Son of Miles and Nellie Thomson of Crouch End, Hornsey. Memorial Reference: Panel 3. Golders Green Crematorium. 90 Sqdn. Royal Air Force Volunteer Reserve. Enid Phyllis Annie Weaver, of Mossley Hill, Liverpool. Killed in Action 24th August 1943 age 26. Son of Charlotte Westwood; husband of Edna Westwood, of Penn. Killed in Action 1st January 1943 age 30, when H.M.S Fidelity was Torpedoed and sunk by U-435 in theAtlantic off the Azores. Panel 79, Column 1. Portsmouth Naval Memorial. 12 Squadron. Royal Air Force. Killed in Action 14th May 1940 age 20. Grave 1. Pouru-St.Remy Communal Cemetery. 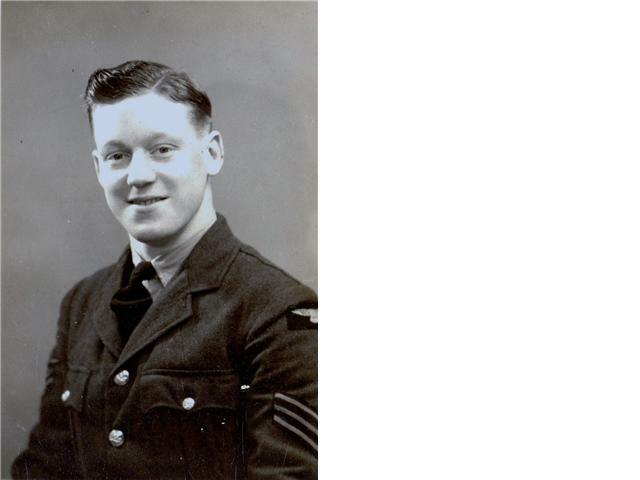 My thanks to Jacky Brookes for kindly allowing me to use the picture of her Uncle Edward when he first joined the RAF aged 19. 106 Sqdn. Royal Air Force Volunteer Reserve. Son of George Edward and Amy Lilian White, of Wolverhampton. Killed in Action 26th June 1943 age 20. Grave Reference Plot C. Row 12. Grave 373. 614 Sqdn. Royal Air Force Volunteer Reserve. Son of James Henry and Florence Laura Willis, of Wolverhampton. Died 25th June 1945 age 22. Prot. Sec. (Officers'). Plot E. Grave 32. 115 Sqdn. Royal Air Force Volunteer Reserve. Killed in Action 22nd November 1942. Son of George and Katherine Wycherley, of Wolverhampton. Grave Reference V. B. 3. Mierlo War Cemetery.